Good news! Governor Jerry Brown just signed AB 2819* to protect the privacy, credit, and reputation of tenants who are involved in eviction lawsuits. If you didn’t get evicted, you shouldn’t have an eviction on your record. Simple right? Unfortunately not in California. 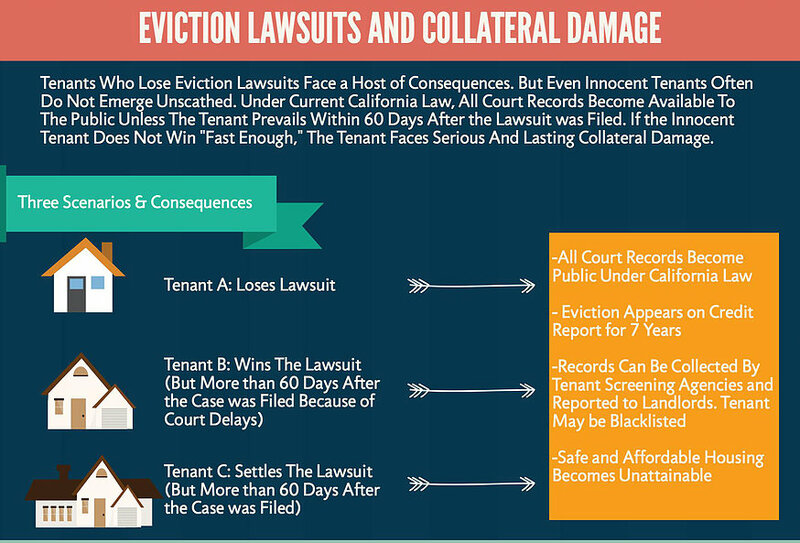 Under current law, if a tenant does not prevail in an eviction lawsuit within 60 days, all court records relating to the case become public. Credit agencies collect the information, which then appears on the tenant’s credit report and on landlords’ blacklists for up to seven years. As a result, the tenant may be rejected for all available rental housing, particularly in competitive housing markets. The problem is that current law punishes tens of thousands of innocent tenants across California every year, including tenants who successfully settle, secure a dismissal of the case, or win after a trial, but have the misfortune of doing so after the 60 day deadline has passed. Eviction lawsuits are supposed to be heard within 20 days of filing, however following severe budget cuts and court closures during the economic downturn, statewide delays in the judicial system now commonly push these hearings past the 60-day mark. The law also unjustly harms tenants who are never given notice of the eviction lawsuit or afforded their day in court, only to find out—in some cases, after years have passed—that their credit has been ruined. AB 2819 puts forward a commonsense solution. The legislation would reform California Code of Civil Procedure 1161.2 to ensure that all tenant records remain private unless landlords prevail within 60 days of filing eviction lawsuits. In other words--unlike existing law--records would be released only after landlords obtain a final and valid court judgment against tenants. AB 2819 therefore not only protects innocent tenants, but ensures that landlords retain access to relevant information they need when making rental decisions and builds on California's efforts to promote fair access to court records.